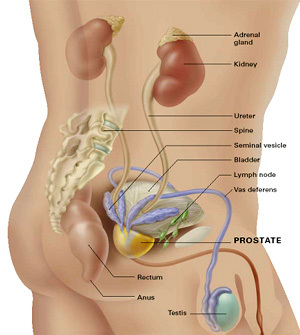 This type of cancer occurs in the prostate glands in men. Prostate is responsible for the production of seminal fluid, which nourishes, transports, and lubricates sperms from acidity. Prostate cancer is very common in men. The cancerous cells initially replicate slowly and are confined to the prostate glands. Cancer cells that grow slowly require minimal or no treatment. However, cancers that spread quickly and are aggressive require extensive treatment. In its early stages, prostate cancer shows no signs and symptoms. The symptoms below occur at advanced stages. It is unclear what the causative agent of prostate cancer is. However, the cancer begins when abnormal cells in the prostate, mutate, and replicate more rapidly than normal cells. While other normal cells die, the cancerous cells continue living. They eventually form tumors that invade other tissues nearby. Some cells may metastasize (spread) to other body parts. Risk of getting prostate cancer increases with age. Black men have a higher risk of getting prostate cancer than men from other races. The disease is also more likely to be advanced or aggressive in black men than in other races. Family history. Men from families with a history of prostate cancer have a higher risk of getting it. The risk is also increased if there is a history of breast cancer in the family; or if the family has genes associated with breast cancer, such as BRCA1 and BRCA2. Prostate cancer is more likely to develop to advanced stages among obese patients than in normal patients. Eating healthy diets comprising of fruits, vegetables and whole grains. Regular medical checkups by the doctor.